Miss Plecia is all dolled up. She has been stuffing herself full of organic material and nectar in her swampy-syle pad for the past 20 days with hopes of finding her lifelong mate. It’s 4 p.m., the sun is blistering and “happy hour” is about to start. Happy hour lasts around four hours in the summertime and is when Plecia and all of her girlfriends gather to find their dream guy. It’s usually in a warm and muggy place, which is ideal for mating. Plecia was buzzing with her friend Diptera on the way to find their swarm of potential mates when Diptera detected a warm air current and departed from the crowd. Diptera never made it to happy hour. Her senses failed her as she came in contact with an 18-wheeler. She had mistaken the car’s hot exhaust for natural warmth. Her remains acidified on the truck’s hood, eating away at the paint. Plecia carries on, she has lost so many friends already to the highway. She knew how to cope. Plecia and Nearctica spent the entire evening together, and Nearctica gladly fertilized Plecia’s 350 eggs. She was the perfect mate to pass his genes onto. But, within 72 hours, Nearctica died without regret. He found his soulmate and kept the unspoken “to death do us part” promise. Plecia still dragged her partner’s corpse around while finding a safe place for her eggs to hatch.The relationship must have weighed her down (literally), she died the next day. Being four days old, her friends said she had lived a long life. Plecia and Nearctica are love bugs (scientific name Plecia nearctica)–the pests you may be familiar with if you live along the Gulf Coast or throughout Florida. My first memory of them was when I was about five and I saw a pair flying around. While mating, the female and males fly around, attached by their backsides. I reached out my hand and closed it until they were flying around in my grasp. Don’t worry, little bugs. I will unstick you. I heroically (or so I thought) plucked them right apart. They fluttered briefly before falling to their death. Not only was I a murderer, but as I would later find out–I was a homewrecker too. To most other residents who live in places muggy enough to encounter them, they mainly exist as sticky white goo spattered about the hoods of cars and trucks in the months of April and May, and then again in August and September. That goo, which is mainly made up of the females insides and eggs, dries on the cars, often eating away the paint. Once it dries, the acidity of the guts jumps from about 6.5 pH to 4.25 pH, causing a new paint job to look speckled. 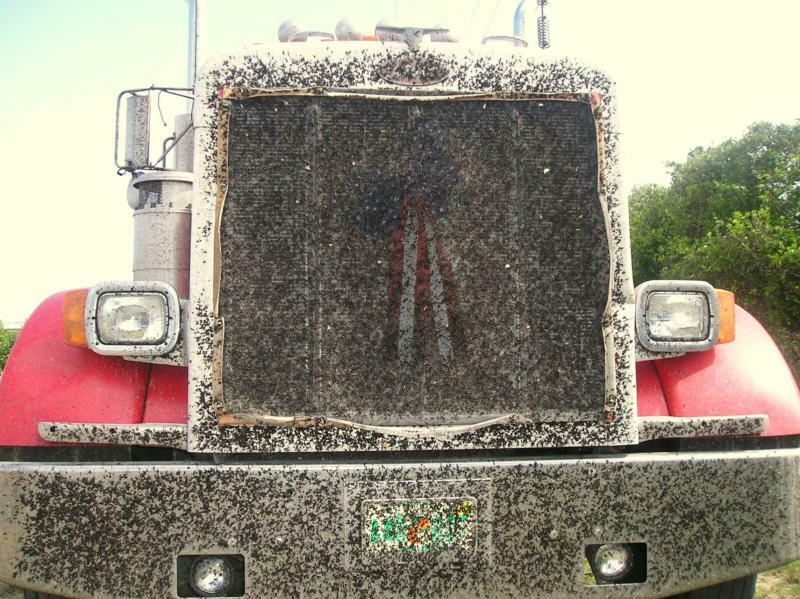 Other times, the bugs may clog radiators and smear across windshields, making it hard to see. But, where did these “bugs” come from, and what role do they play in our ecosystem? If you’ve ever driven along the Gulf Coast in love bug season, your car will look something like this. I placed quotation marks around the word bugs because love bugs are not actually a true bug in the scientific sense. Unlike true bugs, that belong to the order hemiptera, love “flies” (a more appropriate name) belong to the order diptera. They belong to the family bibionidae which is nicknamed the family of march flies and are closely related to other infamous pests such as the blood-sucking mosquito, sand flies and gnats. 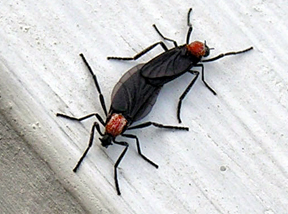 Love bugs also go by other clever nicknames such as honeymoon fly, kissing bug and double-headed bug. Their huge “swarms” occur twice a year, once between April and May and then again–in greater numbers–in August and September. The numbers are said to reach up to the hundreds of thousands, partly due to the fact that hey have few natural predators (spiders are the most well-known predators) and the females each carry between 100 and 350 eggs. The reason the swarms occur in summer months is because the rate at which the larvae mature increases with the temperature. The larva are really the beneficial stage of this pesky, but harmless fly. The babies feed on decaying organic material and break it down so that it can be used to nourish plants. They do this for about 20 days before they mature into their adult form. Larval Lovebug. Photo: Dr. Timothy A. Mousseau, Dept of Biological Sciences, University of South Carolina. Their mating ritual is similar to the story of Plecia and Nearctica, chronicled at the beginning of this post. The males fly above the females, and sweep one away. Generally more dominant males fly toward the bottom of the swarm to get a fit male, who is more plump than the other females. They then fly off to find a leaf, or some other green surface to relax and finish mating upon. But, the male must get tired out from the action-filled honeymoon and dies shortly after. The female drags around the corpse with her while she lays her eggs before she dies about 20 hours later. The reason the bugs are attracted to the vehicles that give them an early fate is both because of the temperature from the hot engines and the formaldehyde found in gasoline and fumes. The chemical attracts the female because she senses it as an organic safe spot to lay her eggs. There is a bit of a controversy when it comes to the question of how this invasive species arrived to the United States. Some experts used to be convinced that the influx of love bugs was due to a University of Florida genetic experiment gone wrong. They speculated that scientists engineered them to eat the overpopulation of mosquitoes. Of course, love bugs do not eat mosquitoes and the theory is bogus. The most accepted theory of how they got here is just simply migration. 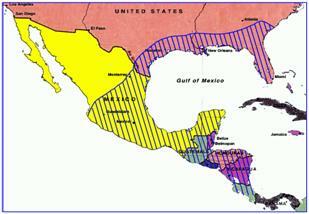 The flies originated in Central America and began moving north where they were first discovered in the US by D.E. Hardy in Texas and Louisiana. They progressively migrated eastward, reaching Florida, and then further south from there taking up the whole state by the 70s. The bugs have been reported as far north as North Carolina. Some say the bugs came over in stowaway ships from Central America that were docked in New Orleans, but UF entomologist Norman Leppla told the Gainesville Sun he dismisses that theory because of their short lifespan and delicacy. He believes the expansion has to do with the simultaneous rapid building of roads and highway systems along coastal areas. After Eisenhower’s federal Interstate Highway System was approved in 1956, the swarms of bugs, according to Leppla, started migrating at a faster rate. Since the older cars had no AC, the bugs that got sucked up into the cars while traveling would pop out at different places along I-10 and start another population somewhere else. And, so by the time I was 5 years old, I was a murderer and homewrecker of loveable bugs like Plecia and Nearctica. And who knows how many more I’ve killed on my trips along the entirety of Florida. But, no matter how many hours I spend driving with a blurry, sticky gut-covered windshield, I will try to remember that the love bugs babies are helping my favorite Florida plants grow nice and tall. And, that’s the inaugural post of my new series: Summer Science Explained. Suggestions for topics being accepted now!